The Paris Agreement has shone a spotlight on the vital role that forests play in climate change – and for the first time, heavily-forested nations have pledged to support conservation and sustainable management of forests. But most of the attention has been focused on rainforests. Dry forests in places like Sahel barely make the news, or tap the interest of policy makers, and yet, more than one billion people make their living from these dry tropical lands. People rely on these forests, which have an extended dry season, to yield not only food, but also timber, charcoal and other products such as shea butter. One of the largest areas of dry forest lies in the Sahel region of western and north-central Africa, which stretches from the Atlantic Ocean eastward through parts of Senegal, Mauritania, Mali, Burkina Faso, Niger, Nigeria, Chad, and into Sudan. Under the CGIAR Research Program on Forests, Trees and Agroforestry, scientists from the Center for International Forestry Research (CIFOR) are studying contributions that dry forests make to people and landscapes in Africa. “The most surprising finding is that dry forests remain a neglected ecosystem in terms of development and investment focus,” said Terry Sunderland, a principal scientist at CIFOR. For Sunderland, the fate of the forest is inextricably interlinked to that of the people who live there. Each depends on the other for survival. The Sahel region is beset with increased temperatures and drought. Even with rainfall, this dry zone may be counteracted through evaporation, according to the UNFCCC. This makes community reliance on the land and dry forests even more tenuous. The European Union (EU) estimates that in the Sahel region, 37 million people are severely or moderately food insecure, including 6.3 million people in need of emergency food assistance. And when harvests fail, or forests no longer provide sustenance, communities are often forced to leave their homes. 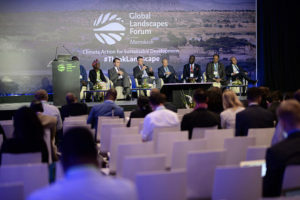 Agostini moderated the Discussion Forum on Regreening heritage landscapes and revitalizing communities in the Sahel and Sahara at the Global Landscapes Forum. This event, which took place on 16 November, was the largest side event on the sidelines of the COP22. Unless the diverse causes of food insecurity are addressed, there will be no permanent solution for the Sahel region. Re-greening has been touted as one way to solve the problem, but there are still many aspects linked to re-greening that need to be addressed, including land ownership and community needs. So how can these dry forests be maintained? How can communities move forward? Agostini advocates taking a regional approach to solve the diverse problems of the countries in the Sahel. 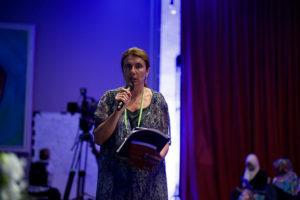 “Ecosystems don’t have borders, so we need to have a program that connects all the countries from Senegal to Ethiopia and also North Africa using real landscape approaches to ensure better ecosystems services and alternate livelihoods,” she said. According to Agostini, the World Bank’s approach is to make sure that these interventions make sense and are financially, socially and environmentally sustainable. CIFOR-conducted research has identified an urgent need for evidence-based policy on dry forests and the need for more research and data to meet this need. A 2015 CIFOR study showed that policies that reinforce the rights of the most vulnerable to access key resources and sustainable development programs will simultaneously increase their ability to adapt in the face of climate change and improve food security. Scientists also found that reforesting lands should integrate the value of trees for livelihoods and diversity that can provide food in times of scarcity. 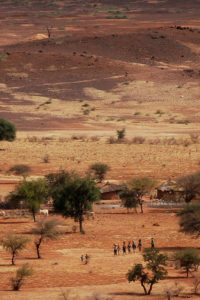 It suggests that the integration of forests and landscape restoration should be improved as part of land-use plans to ensure food security of smallholders in the Sahel. “We need to develop strategies that are more inclusive of forests in development strategies and provide formal incentives for their conservation and restoration,” said Sunderland.